Today's random set is 858 Auto Engines, released in 1980. 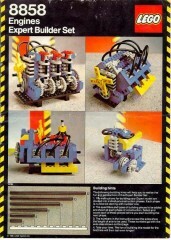 It's one of 4 Technic sets produced that year. It contains 242 pieces. It's owned by 124 Brickset members. If you want to add it to your collection you might find it for sale at BrickLink or eBay. I put these together and tried to mount them to the chassis set. My grandmother owned this set and let the grandkids play. The pistons never seemed to move very well, or at least that was my recollection. Those were fun sets though. Huwbot is on a ROLL!!! 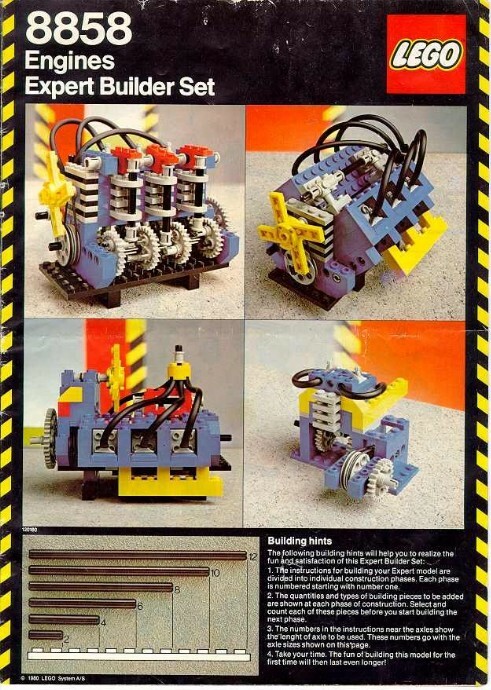 Why don’t I own any of these old Technic sets?? This looks so cool! It's still the 23rd in my time zone, so Happy 1st Birthday Huwbot! My oldest brother had this set. I like to think it was partly responsible for shaping him info an engineer... and my sister and I, as well. So Huwbot's strategy is to give several great sets, then one hilariously bad one? I'm fine with that, as long as the great ones outwiegh the... um, Clikits. Things are definitely more hectic in the engine bay of modern Technic sets today. Yet there was something with the design of the older ones that felt "Technic". I don't know, maybe it's the nostalgia. Neat. Wish I had found one in a old LEGO lot, but never did. @Namekuji Hewbot’s heart is a clickit. I'm not sure the UK ever got this one either? I certainly don't remember seeing it in the catalogue at the time (somewhere or other I have a copy or two of the 1980 catalogue, but I think it's buried in a box!). It also seems to be one of the hardest to get hold of - it hardly ever comes up on ebay! This set have an interesting story. It was only sold in North America, and not in Europe. There was also two set numbers for this set within NA, IIRC, Canada got the European three-digit numbering 858, and the United-States had the 8858 set number. 8858 is way more common than the Canadian 858, as reflected in Brickset's owned number. This seems really cool, but I wonder how well it sold. It doesn't seem like the kind of thing kids would want. "8858 is way more common than the Canadian 858, as reflected in Brickset's owned number." It is 216 compared with 154. Considering the US market is much larger than the Canadien market, I would say it is relatively rarer in the US. This set WAS released in both the US and Canada. The US version is 8858 and the Canadian version 858. However, BOTH sets of instructions are labeled 8858...there is NO 858 listed instruction. This is different from other similar time-period releases. For example, the 8857/857was released here and also Canada-but up there, the instructions are actually are printed 857. Also of note? The faucets that represent the spark plugs were CHROME in the Canadian sets, not in the US ones. I have multiple of the US (one sealed) and a couple of the Canadian sets, along with conversations with other collectors. As an Expert Builder fan of 9 years old at the time this was definitely meh compared to the others, but a few years later became very appealing. It would be fun to see an updated version today. What was great is that it worked with the chassis available at the time. I think it also had an alternate build for a sine wave machine if you supplied felt-tipped pens or markers. It was pretty cool but probably didn’t sell well. @jackthenipper Reminds me of the MOC of the green alien in the index of the first Lego Book from 2009 that demonstrated that DUPLO, QUATRO and Clikits were compatible to the Lego System. I'm upset I could not find an image of it on the internet but maybe someone knows what I'm talking about? Boy, this one brings back memories. My father who built and drove his own racecars, bought this one for me (I think with the hope I would somehow get interested in the same!). Never did, but I remember the many days and nights I built all the engines in the instructions and tried to mount them in the various creations I made with my limited supply of Expert Builder sets. Compared to the engine setups in today's Technic Sets, these are quite rudimentary and simplistic. But that just left a lot to one's imagination to take it from there! As a result, each piston in a bank required a minimum 3x3 footprint, plus 1 additional for the side and end. That's more than twice as much footprint as the current pistons. But consider how that impacts the Bugatti Chiron. The current model uses a V8 and 2 I-4s connected by three 24-tooth crankshaft gears. The actual car has a single crankshaft shared by two 15-deg VR8s. With the old piston parts plus design ID 32126, it would be possible to more-accurately create the W16's actual design. It's too bad they couldn't marry the two approaches: support the smaller, round piston heads and 2x2 footprint cylinders, but allow for construction of the connecting rods and the cylinder surrounds.